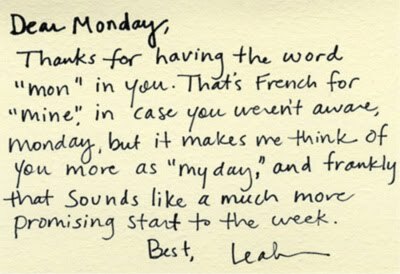 I don’t know who “Leah” is, but she makes a very good point (apart from the fact ‘mon’ means ‘my’ not ‘mine’, but we’ll paper over the cracks)! So if you’re struggling with beginning-of-the-week blues, turn it around by taking ownership… Monday is yours, and therefore you can choose exactly the kind of day you want to make it. It’s as easy as that. That has just made me feel much better about Mondays! Totally with you on the “my” not “mine”… a fellow pedant! Not quite sure how I stumbled onto your blog, but I’ve been having a nosey around and love it!